In July 2014, some Dr. Mordechai Kedar said: “the only thing that deters them (terrorists) is if they know that their sister or their mother will be raped in the event that they are caught.” In December 2014, several scheduled appearances in UK were cancelled for his association with Pamela Geller, a racist from the U.S. who was banned from the U.K. Recently he recommended dismantling nation-states in the Middle East and Sudan. Melanie Phillips a British Jewess journalist holder of the Orwell Prize for Journalism in 1996, supported this opinion by writing: “Given the carnage in Syria and the intractability of such a complex religious and ethnic civil war, it has often been observed, rightly, that the very notion of one unified country is inimical to Arab culture. It was imposed upon the Arab world after World War One by western countries which either didn’t realise or didn’t care that the nation state was wholly inappropriate for a culture which was fundamentally tribal. What we’ve seen happening, not just in Syria but more widely throughout the Arab world, is the collapse of that nation state model into feuding tribes and clans. 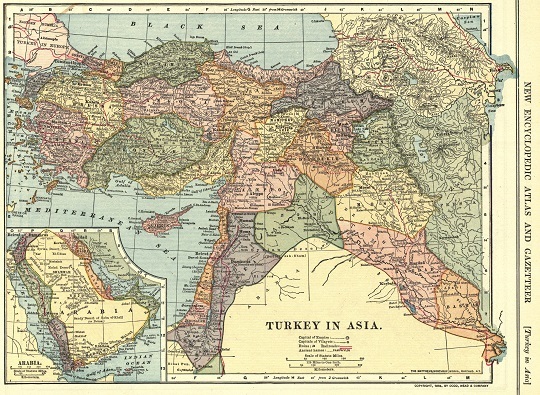 Accordingly, some commentators have suggested that the only solution for Syria is to divide it into enclaves reflecting a culturally authentic tribal pattern.” Jews pretend to forget that these nations had great states, history and civilizations, and were not tribal nomads like Turkic Jews and, to lesser extent, the Semite Israelite. Expect Millions of Iraqi Refugees Shortly, By Dr. Mordechai Kedar, posted on Arutz Sheva on 31/08/17. In an article last week on Arutz Sheva, I wrote that Syrian President Basher Assad is regaining power with the help of an Iranian Shiite coalition made up of Iranian fighters joined by Hezbollah, Iraqi and Afghan militias. In the near future, I predicted, it is possible that this coalition will try to rid the country of the millions of Sunnis who make up the majority of Syrian citizens, in order to prevent additional rebellions of the type Syria experienced from 1976 to 1982 and has been suffering from for the last six and a half years. As a result of last week’s article, I was contacted by Sheikh Walid el Azawi, an Iraqi Sunni living in exile in Europe, who heads a party called “The Patriotic 20 Rebellion.” He wanted to tell me the shocking story of the situation in Iraq, where he claims that for years now, Iran is the real ruler and its Ayatollahs dictate Iraqi government policy and actions. The Shiite’s desire to rid the country of its Sunni minority is motivated by a desire for revenge, because up to the year 2003, Saddam Hussein ruled Iraq, and treated the Shiites with terrible cruelty all the years he was in power. After his defeat in the First Gulf War in February 1991, he used artillery to butcher tens of thousands of Shiites who attempted to find safety at the gravesite of Hussein ibn Ali in the city of Najef. There is an even older feud between the Iranians and the Iraqi Sunnis, dating from the 1980-1981 war forced upon them by Saddam Hussein. This war took the lives of over a million people, both citizens and soldiers, on both sides. It is important to recall that both sides used chemical weapons against each other during that accursed war which ended in Iran’s defeat when the chemical warfare waged against Tehran killed thousands of civilians. The Iraqi and Iranian Shiite desire for revenge on Saddam Hussein is now directed against his entire religious sector, the Sunnis, who stand unprotected and unarmed against a rising, strengthening Shiite world. The collective power of Sunni forces – made up of organizations such as ISIS, al Qaeda, the Syrian rebels and countries such as Saudi Arabia, Jordan, the Emirates and Egypt – is weakening rapidly over the last few months in the face of the growing strength of the Shiite coalition made up of Iran, Hezbollah, and the Iraqi and Afghan militias. Sheikh Walid el Azawi claims that as a result of this enormous shift in the balance of power, the Shiites will do everything they can to expel the Sunnis from Iraq to any country willing – or unwilling – to accept them. If this scenario does come to pass, about ten million Iraqi refugees will soon be joining the waves of the 15 to 20 million already existing refugees. This wave of refugees can turn Europe, North and South America, Asia and Africa into economic disaster areas, leading to social unrest and political maelstroms. Do not forget to thank Iran and all those who strengthened that country during the past few years. During my conversation with the Sheikh, I asked him what solution he and his party have to offer to save the Iraqi Sunnis and convince them to remain in their homeland. His answer came as a total surprise: “The Emirate Solution.” He is convinced that this is the only real solution that can save the Sunnis in Iraq from ethnic cleansing. The country must be divided into regional states, on the lines of the USA, or cantons as in the Swiss model, each with internal autonomy. Iraq would become a federation with a limited central government while the Emirates would run the lives of whatever group resides in their territory. Each Emirate would lead its own life and refrain from interference in the policies of the other Emirates. Each Emirate would be ruled by a local Sheikh who originally stood at the head of the families within the Emirate’s borders, following the population’s social traditions. This, claims the Sheikh, will create harmony, stability and peaceful relations with neighboring Emirates for the good of all the citizenry. For illustration’s sake, let us recall that the northern Iraq Kurdish region is surrounded by countries that do not share the Kurdish dreams of independence, and has no corridor to the sea. If the neighboring countries allied against the Kurdish state, should one be established, preventing goods and people from reaching it, the Kurds would have no way of leading normal lives. How would they export oil and other products in that case? How would they manage to import necessities? If the Kurds finally achieve independence in the framework of the Emirate Solution for Iraq, ending the struggle that has been going on for years, where is the problem? Clearly it lies with Iran, which will not agree to the plan now that it has taken over Iraq – unless it is forced to do so. And the only power in the entire world capable of forcing Iran to agree to anything is the USA. Sheikh el Azawi is prepared to go to the US at a moment’s notice in order to meet with decision-makers there and explain the logic behind his peace plan for Iraq and the benefits its implementation would bring the world and the Iraqis themselves. The Americans, however, are busy dealing with four other issues: North Korea, the relations between the right and left inside America, who is going to resign or be fired on Trump’s staff and natural disasters like Harvey and the flooding in Houston this week. Who could possibly have the time and patience there to do anything about Iraq, the country the US Army left seven years ago with no desire to ever return? The Americans have been using all their power to preserve the artificial Afghan entity established by the British and Russians in the 19th century, despite the fact that it is filled with ethnic strife which prevents the creation of a homogeneous, united nation. The only result so far is blood, fire and tears. If the Americans and their allies would only take apart the illegitimate entity called Afghanistan and turn it into autonomous or independent states based on whatever local families rule in each one, so that it is governed by rulers with legitimacy, the heads of families and tribes, possibly Afghanistan could be a land of peace and tranquility reigning among its religious, family and ethnic groups, each living its own life and leaving all the others to do so in peace. Interestingly, that same Emirate Solution could most definitely be applied to the seven cities of Judea and Samaria in addition to the Gazan Emirate established a decade ago. I am not a fan of Hamas, but Gaza is a state from every practical point of view, and Israel must find a way to deter effectively and clearly the Jihadist gang that has taken it over. Establishing Emirates in Judea and Samaria will grant the people there stability, prosperity and quiet. It will give Israel peace. That same solution will solve Jordan’s problem as well. It can be divided into a Palestinian Emirate, perhaps more than one, and a Bedouin Emirate. The king will be a symbolic figure as is the Queen of England. Sudan has already split into two states, but both parts should be divided into smaller, more homogenous Emirates in order to bring more stability to this war torn and blood soaked country. Yemen, a totally tribal society, would benefit from the Emirate Solution, becoming more governable and stable, certainly in comparison to the failed central government it has at present, which has brought many thousands to the point of hunger, disease, suffering and death. Sheikh el Awazi’s dream, which I share with him, could become the basic principle employed by the world to solve the Middle East problem. Had it been employed in Syria five years ago, many of its half million dead citizens would be alive today. The Jews are threatened by any strong nation states. Even the possibility of strong, unified nations threatens them and their plans. That is why Gaddafy had to go, and Assad must go. That is why they work tirelessly to divide Americans against each other. That is why Germany had to be destroyed in the 1940s and Tsarist Russia had to be destroyed by these damn Turkified Jewish Bolsheviks. It is quite clear for me now that the colonization of the Americas was not done by Europeans. It was a Jewish grand project and they needed the Europeans to serve them because they are smart and hardworking, and could make the Jews rich. Europeans were not masters of their destiny and not even partners in the Americas. Now, matters are turning against Jewish wishes in USA and slowly in Europe.